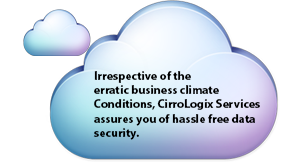 Established in 2012, Cirrologix is a global company built on principles of promoting cloud based technology and limiting carbon footprints by business applications. The company is dedicated to environmental and sustainability issues offering viable and scalable technology Headquartered at the IT hub of India in Bangalore, we are expanding our services by enabling companies to reach the cloud and beyond. Our team of is possessed with technical and marketing expertise that are tested, tried and relied by reputed brands from across the globe. Cirrologix develops software products and offers services of Integration, Implementation, Migration, Re–engineering, Adoption and Training, Consultation and more. To enable, hassle free marketing of the services, we have partnered with Strategic Outsourcing Services for all our and our client’s marketing requirements. The world is heading towards the Cloud and Cirrologix helps you reach there before others and better than your competitors.